Did Sebastian Stan Just Spoil Biggest Infinity War Cameos? For the most part, the cast and crew of Infinity War have done an amazing job keeping the movie under wraps. Each new interview brings up a new challenge of saying just enough without going over the edge and accidentally ruining some surprises for the devoted Marvel fans all over the world. Now, Sebastian Stan may have gone a little overboard in a new interview promoting the epic movie by revealing some names that haven't been associated with Infinity War yet. There are potential SPOILERS for Infinity War ahead, read on at your own risk. The Wakanda fight scene has been the centerpiece for nearly all of the footage from Infinity War that has been released over the last several months. Steve Rogers can be seen leading the charge against Thanos and his Black Order with a giant number of superheroes following him into battle. Sebastian Stan has now revealed some names that haven't been mentioned publicly yet, who are involved in the fight scene. He had this to say. Possibly the best part about Sebastian Stan's comment on the epic Infinity War battle scene is the fact that he prefaces it by saying, "I can't really talk about it..." We knew that Samuel L. Jackson's Nick Fury was going to have to make an appearance at some point, especially after some recent credit reports reveal that he had a makeup artist and an assistant on the set. But, this is the first time that we've seen Michelle Pfeiffer and Michael Douglas' names attached to Infinity War. However, Infinity War and the still untitled Avengers 4 had some filming overlapping, so Sebastian Stan could be referring to a scene that happens in the next installment, though it seems pretty clear that he's speaking about Infinity War and the fight scene in Wakanda. Scarlet Johansson previously teased that there were 32 superheroes on the set for this particular scene and Anthony Mackie recently bumped those numbers up to an unbelievable 40 superheroes. It's safe to say that there's a lot of heroes on the big screen during this particular battle. 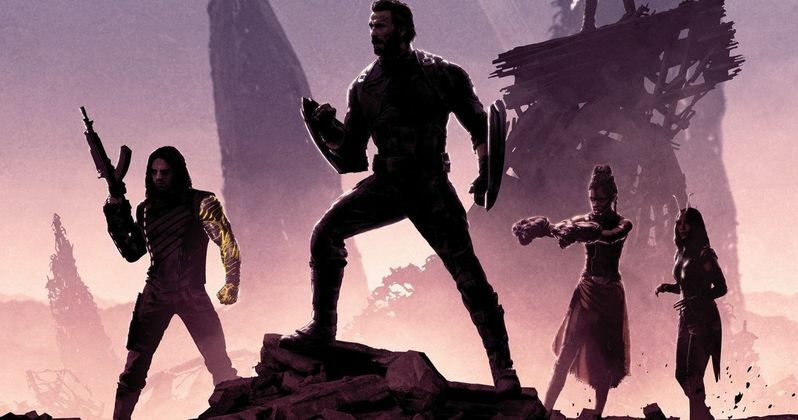 The Russo Brothers have also teased that the Wakanda battle scene is like taking panels of a comic book and unfolding them and then getting another comic book and continuing the process. Additionally, Anthony Mackie has also revealed that the aforementioned scene is a bit on the long side, with 25 pages of script alone. Sebastian Stan could very well have let some pretty big spoilers out about the Infinity War cameos, but we won't know the extent until next week. You can read the rest of the interview with Sebastian Stan and those secret Infinity War cameos via Independent U.K.